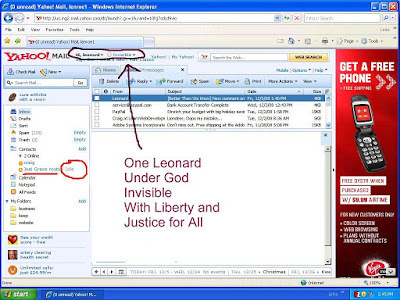 Ok, so smarty pants Leonard posted A day in Joels life, showing a print screen of my Yahoo status as "Idle." Well, the reason I was idle on Yahoo was because, well, you know I was busy running around somewhere doing the Lord's work, being about my Father's business, of course! For a better view click the picture. Query: But is it really a 'Day in Joel's Life'? p.s - The answer isn't always 'b' as some of those foolish Galatians who might have bewitched you in the past to believe. You guys are cracking me up!! Hey! Look again in Leo-dear's inbox!! Leonard is Better Than We Know!!! :)!!!!!!!!!!!!!!! WC, are you trying to tell me that the life I live isn't even my own?????? RJW, on a serious note... really... In the short time that I've known Leonard, that is so very true! So is the answer always 'B'? Mostly no. But if I entitle a blog post, "The answer is always B," then the answer is always B. Unless the Window clipboard messes up and doesn't paste the verse from my PC Study Bible correctly. In that case, the answer might not be A, B OR C.
Ok this thread made me laugh out very loudly and that seldom happens anymore. You guys are way too weird and yet I feel a strange attraction to that. Family "blood" lines run deep, I guess. Keep up the hijinks guys....it keeps us coming back for more. Were only talking Joke's and sword play, Love ya Bro. Right on, right on! :) And all the love right back at ya as well. Sometimes I don't like the yahoo messenger automatic status changing, it doesn't let me act busy while I am not. LOL!